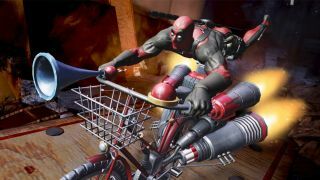 High Moon Studios' Deadpool, based on Marvel's irreverent, fourth-wall-breaking Wade Wilson, releases on Steam tomorrow. The launch trailer is here now, but doesn't do much to make Deadpool's eccentricities appealing, with labored humor about the overuse of dubstep in trailers, Wolverine's haircut, and "booty" as a reference to both treasure and butts. What I saw in a recent preview, however, was much more appealing. I'd have praised this trailer if it were just a clip from the game's opening moments (spoilers ahead, I guess, if the first five minutes of a game counts), in which Deadpool discusses the project with High Moon Studios, revises the script, and even calls up voice actor Nolan North to convince him to do his voice, which he's already doing in the scene. That's good stuff. I saw a few other entertaining moments, including the serious-minded voice in Deadpool's head declaring that he only plays PC games. I know when I'm being pandered to... and I like it. Unfortunately, there were also a fair number of repeating, generic, "Oooh, that had to hurt" catchphrases, which got tiresome amid otherwise good, self-aware jokes about gaming. The sections I played were a mix of beat-em-up (i.e. use a controller ) and gunplay. Without much time to familiarize myself with the enemies or combos, I died quite a bit, which Deadpool berated me for (his powers make any kind of death pretty unlikely). It looks like I only got a glimpse, though—when you get past all the "bang," "babes," and "mayhem," this trailer suggests there are a few other gameplay styles mixed in, including a sidescrolling platformer section. Unless that's just part of the joke. With Deadpool, who knows?